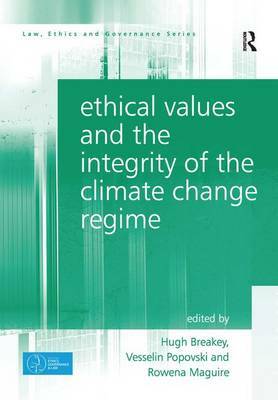 This book investigates the ethical values that inform the global carbon integrity system, and reflects on alternative norms that could or should do so. The global carbon integrity system comprises the emerging international architecture being built to respond to the climate change. This architecture can be understood as an 'integrity system'- an inter-related set of institutions, governance arrangements, regulations and practices that work to ensure the system performs its role faithfully and effectively. This volume investigates the ways ethical values impact on where and how the integrity system works, where it fails, and how it can be improved. With a wide array of perspectives across many disciplines, including ethicists, philosophers, lawyers, governance experts and political theorists, the chapters seek to explore the positive values driving the global climate change processes, to offer an understanding of the motivations justifying the creation of the regime and the way that social norms impact upon the operation of the integrity system. The collection focuses on the nexus between ideal ethics and real-world implementation through institutions and laws. The book will be of interest to policy makers, climate change experts, carbon taxation regulators, academics, legal practitioners and researchers.